On May 18th, as you already know, I spent a long while visiting all levels of the old building. Conal offered to take me into the new build after that, but, despite having no teaching commitments on Wednesday afternoons, I said I had better head back to school. 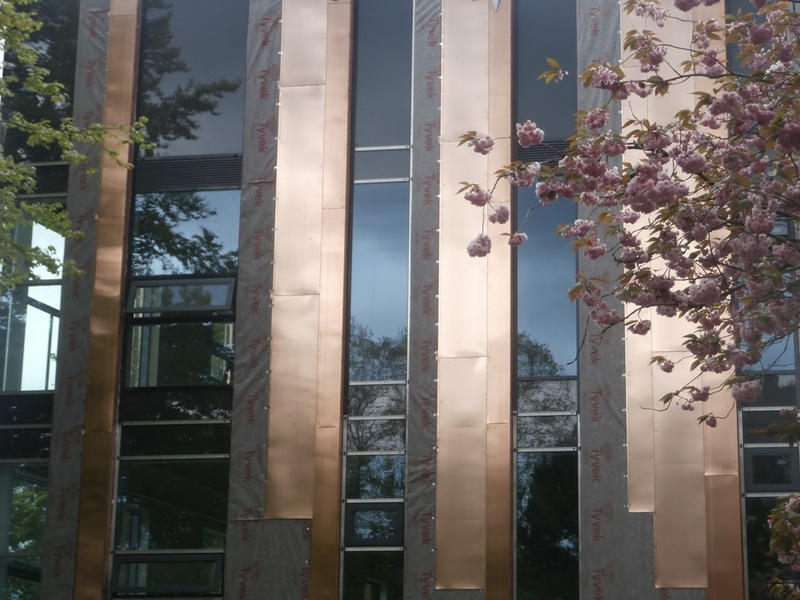 I took some shots of the trees against the copper panels in the sunlight before I left, though. It was just as well. I was never to get that close to the new building again until the day we moved back in. Cherry Tree in full-bloom behind its tree protection fencing. As the NHSG project page on the EWA website makes clear, the site renovation scheme has been carefully designed to fit within the Tankerville Conservation area setting and has received praise from both English Heritage and Newcastle Conservation Advisory Panel. 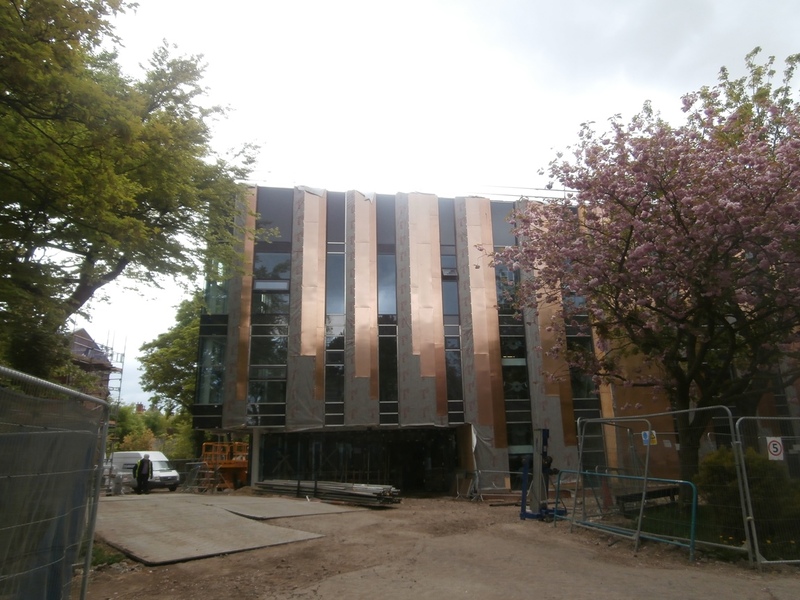 The new build’s glass and copper panels in particular are designed to complement the trees on site: the metal panels resembling tree trunks as they darken over time and the glass reflecting the leaves. 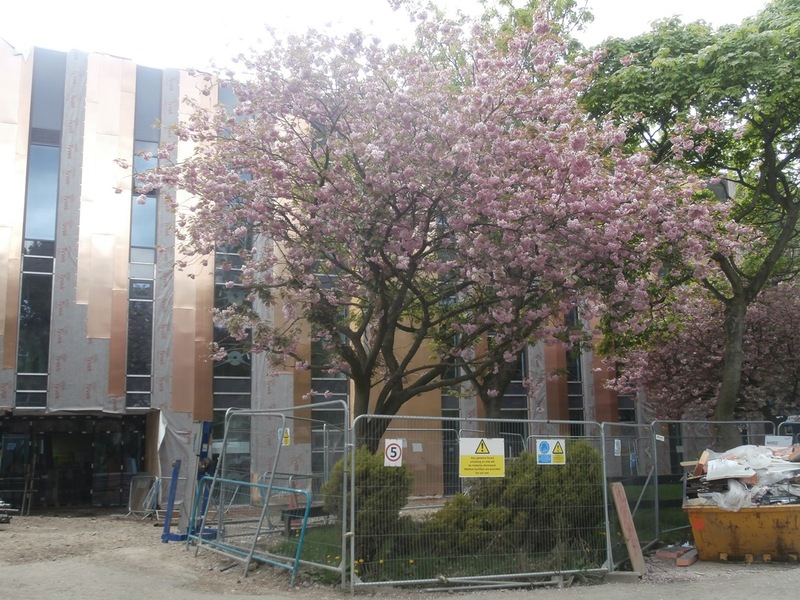 The glass panels reflect the trees on site in a marvellous way. My intention was to return on Saturday morning when I’d have more time to spare and the site would be less busy. It was the roof garden on floor two of the new build I wanted to check up on. But that never happened, of course. I phoned Peter from the Metro to tell him I was on my way, only to be met by a very long pause. Had I not got the message, he asked? “What message?” I replied. The message that no staff were to be allowed on site from now on. “And that includes Christine too,” Wates had been told by Hilary. Peter thought they were pulling his leg at first. But that wasn’t the case. They couldn’t understand why. Thank goodness I had Giuseppe. As the saying goes ‘When the Lord closes a door; somewhere he opens a window.’ That’s from ‘The Sound of Music’ not the Bible, by the way. 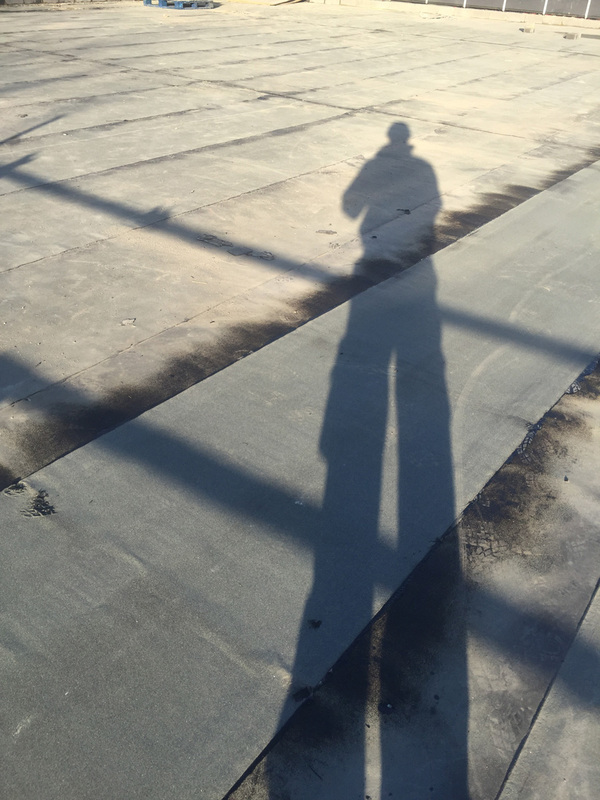 The shadowy Giuseppe was luckily photographing the roof terrace on Friday 20th May. 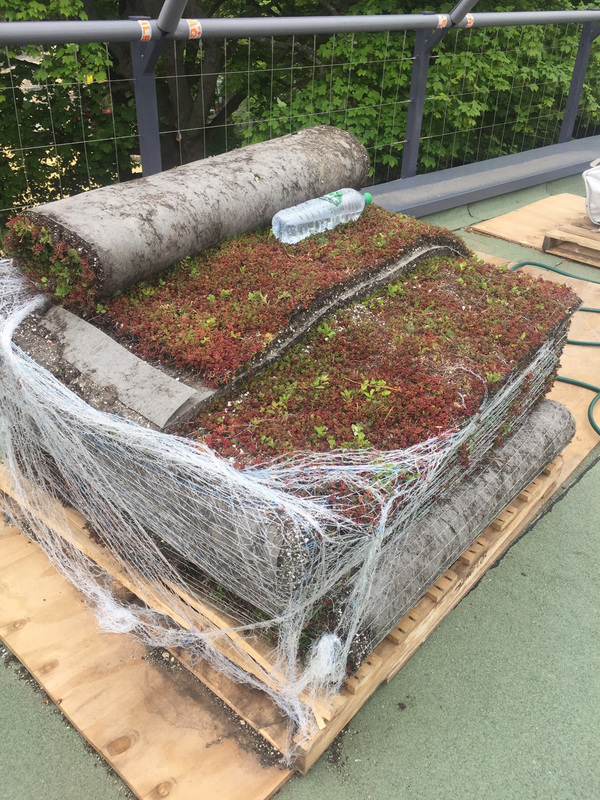 I’d been curious to see how the living roof was coming along ever since I’d seen the sedum blanket delivered on its pallets on May 11th. Thanks to Giuseppe’s photos, not only can I show you what it looked like when finally laid, we can get a sense of the process too. 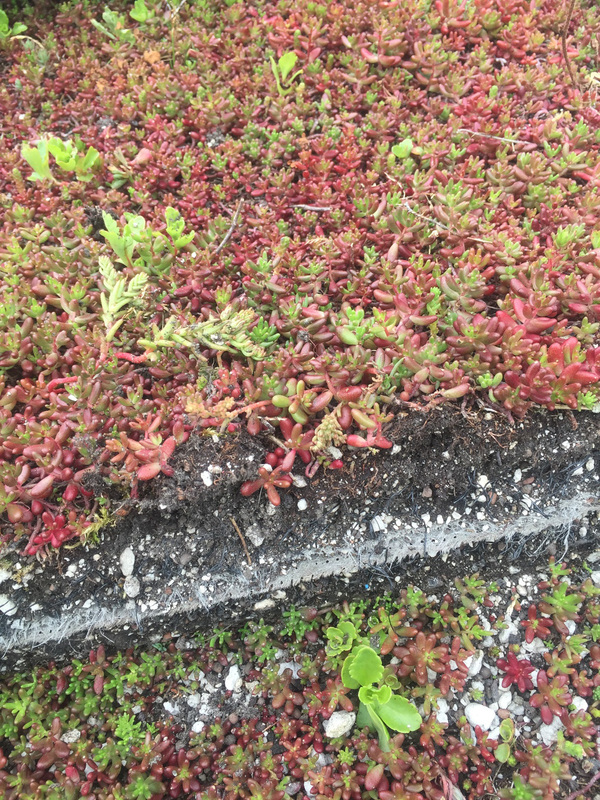 As the many living roof websites explain, sedum can be grown on a light blanket or on a substrate. In our case, it seems to be the latter. The pallets were all now lifted onto the roof. Brick/shale substrate was laid down next in a contained area. Close-up, the matting’s wire base can be seen. 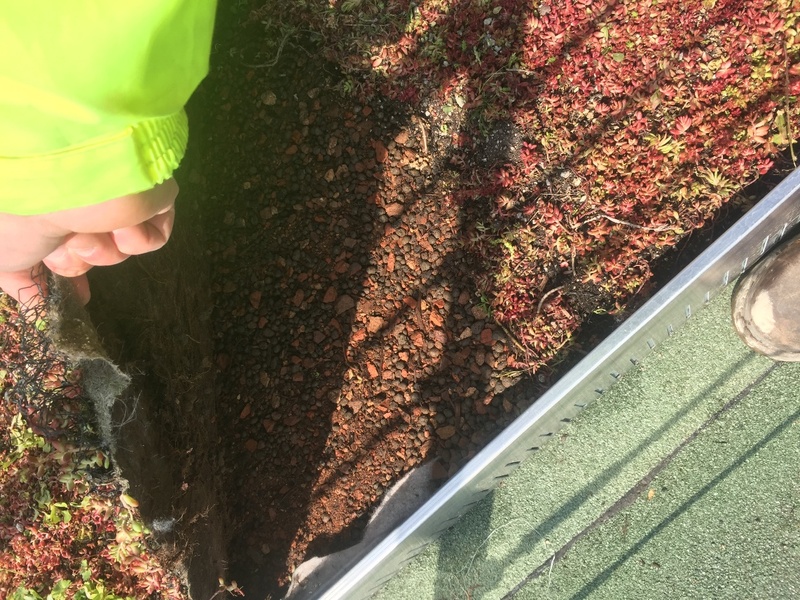 From Giuseppe’s photos, we can see that aluminium green roof edges, connectors and corners were used to retain the aggregate substrate and that slits in the structure are there to allow drainage. 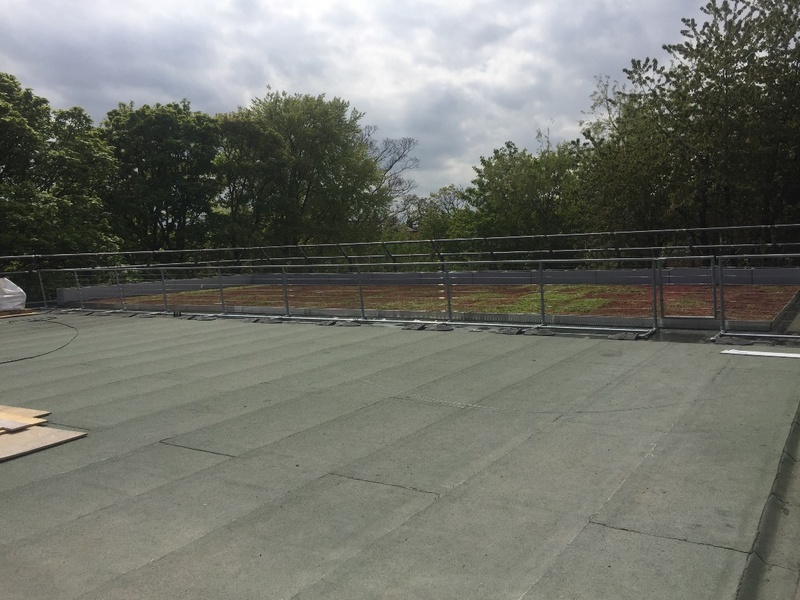 Also that our roof is made up of long lengths of mat edge to edge. 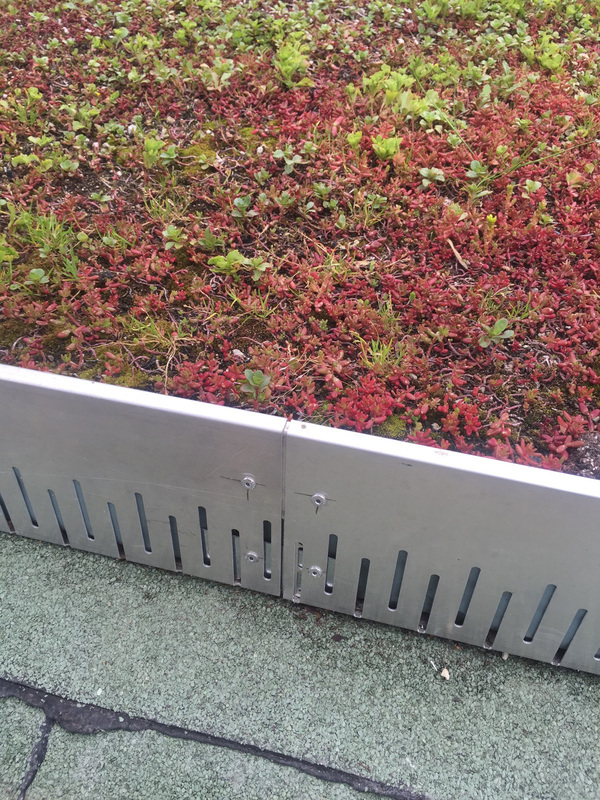 Aluminium roof edging allows drainage to occur. 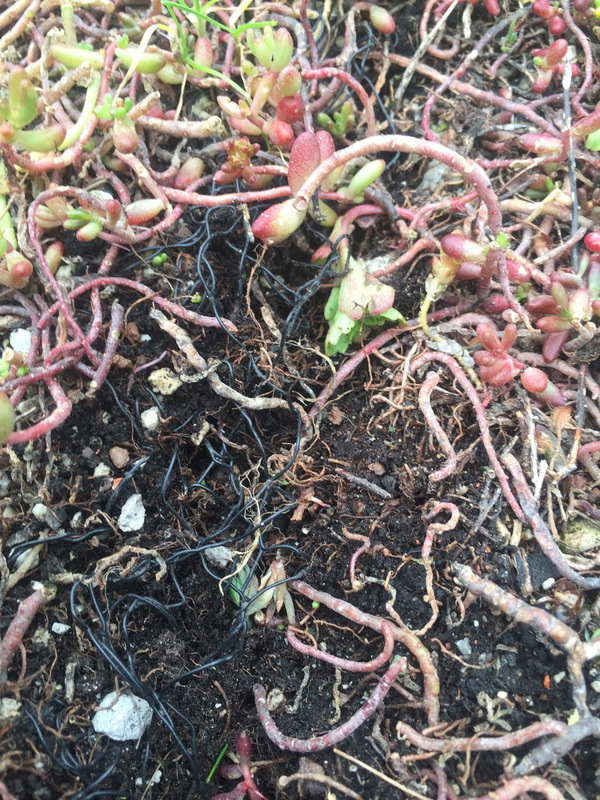 The sedum blankets will grow together. Both from a distance and close-up, the finished roof looks superb. 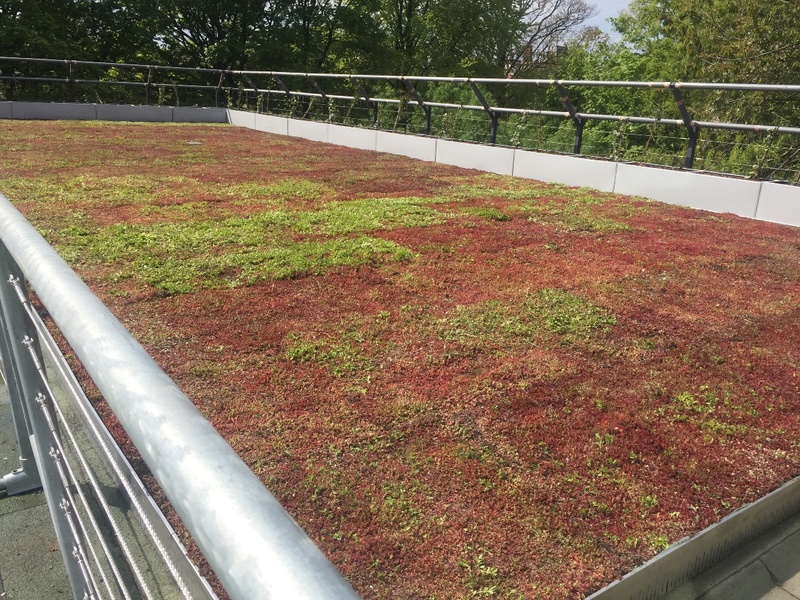 From the side, it is rather reminiscent of luscious red turf and from a distance it gives real character to the large flat roof. 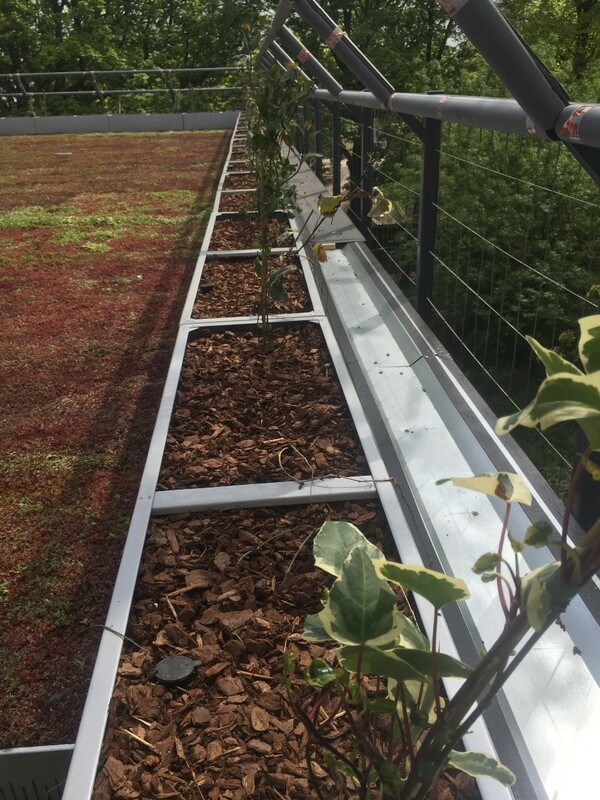 From the photograph above, you can see that the large aluminium planters ended up being positioned along the north and west edges of the sedum – the sides which run parallel to the outer edges of the new build’s roof-top. From Giuseppe’s photos taken on May 21st, one can get an idea of how the roof-terrace could look in the future. 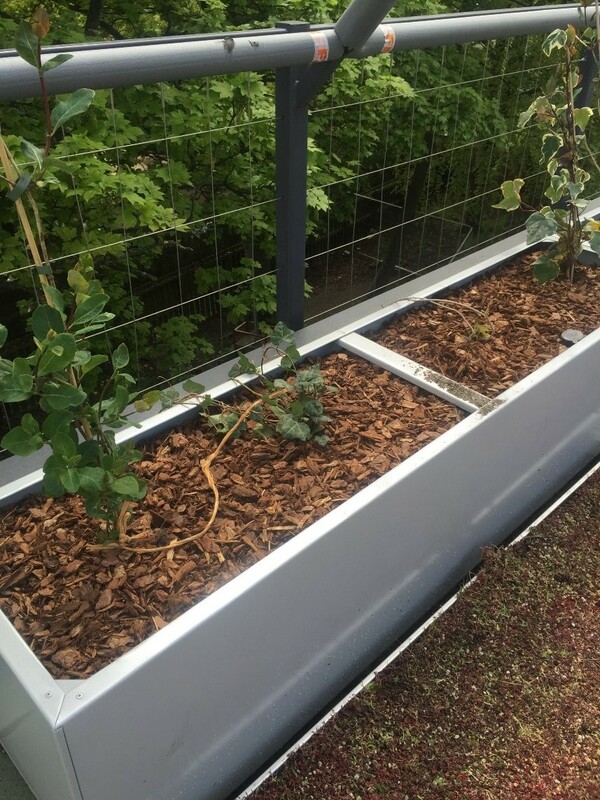 The aluminium planters now hold greenery. Looking at the contents close-up, one cannot help but smile. As I’ve said, ‘When God closes a door, somewhere he opens a window.’ The verdant greenery which has just been planted, and which will no doubt eventually cascade down over the edge, is not just ‘greenery’. It’s not just any old greenery in those planters. No, if you look very closely, you can see that it’s most definitely IVY! An ivy curtain could soon replace the ivy cross. If you attended the Church High Alumnae Reunion on Saturday 24th, you will have seen the video I made charting the history of Newcastle High School from Jesmond Road in 1889 to the return to Tankerville in 2016. Displayed very large on the video wall in the new build Dining Hall – which is made up of no fewer than nine 47″ digital television screens – the changing forms of the Tankerville site held the eye rather like a kaleidoscope. One of the last images I chose was the roof terrace in early September – all bright sunlight and rich jewel colours. Nature is still at the heart of Tankerville. 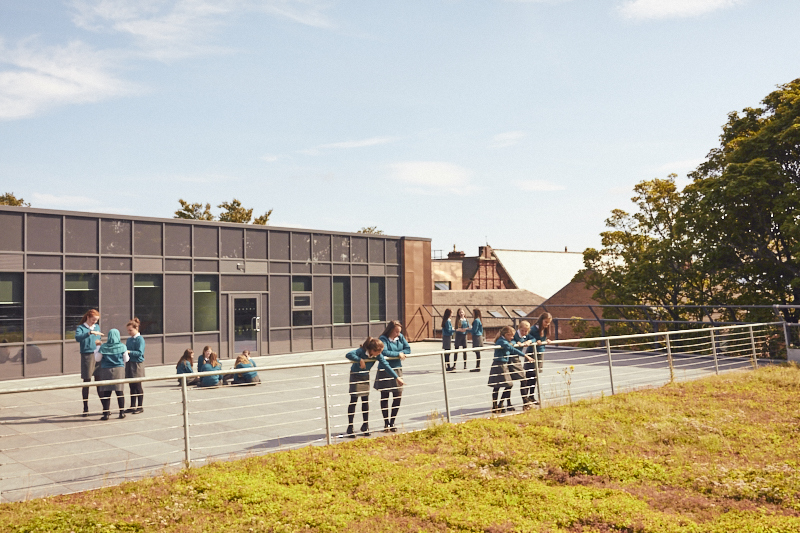 Newcastle High School girls on the roof terrace in September. 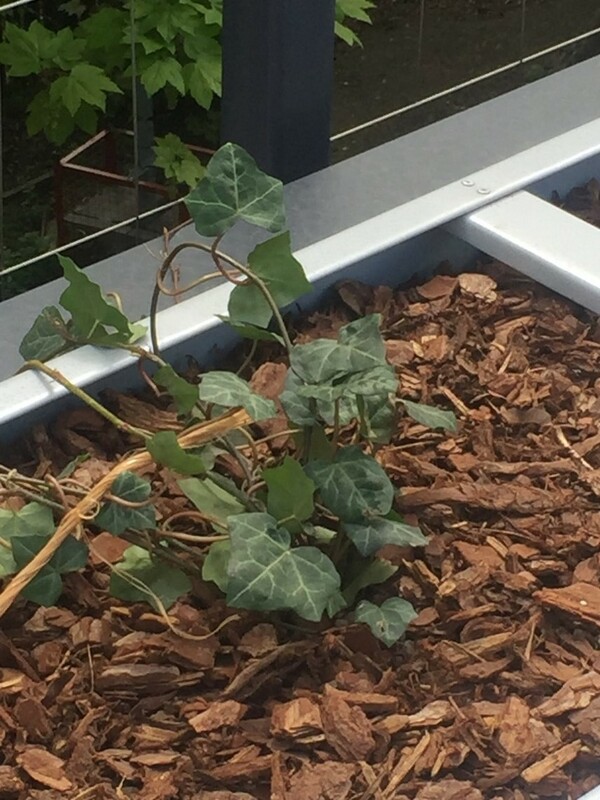 Three cheers for the ivy! Like the flaw in the Persian carpet, it is essential to the whole. Love the sedum, by the way. Good luck with the move in.